254 pages | 44 B/W Illus. Rational Emotive Behaviour Therapy (REBT) is one of the most widely used counselling approaches in the world and is one of the original forms of Cognitive Behavior Therapy (CBT). 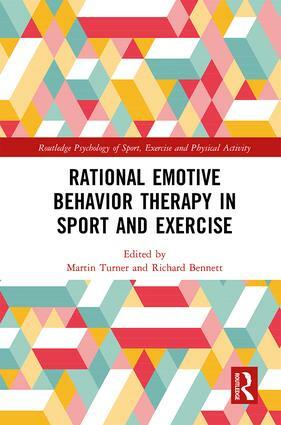 Rational Emotive Behavior Therapy in Sport and Exercise is the first and only book to date to examine the use of REBT in sport and exercise. Offering an invaluable insight into the practical application of REBT, this book is essential reading for undergraduates, postgraduates, trainee and qualified sport and exercise psychologists, and counsellors wishing to move into sport and exercise. Martin Turner is a Chartered Psychologist and Associated Fellow of the British Psychologyical Society (BPS), is registered as a Sport and Exercise Psychologist with the Health and Care Professions Council, and is a Chartered Sport and Exercise Scientist with the British Assocation of Sport and Exercise Sciences. He is a prominent REBT Researcher and Speaker, and Senior Lecturer in Sport and Exercise Psychology at Staffordshire University, UK. His work using REBT in sport was featured in The Psychologist, the BPS's magazine. Martin was awarded the BPS Division of Sport and Exercise Psychology PhD of the year prize in 2013. He is currently Lead Psychologist for England Futsal with the FA. He has previously worked with Stoke City FC and Nottingham Forest FC, Staffordshire County Cricket and Nottingham County Cricket academies, and business organizations such as SONY. Richard Bennett is a Chartered Psychologist and Associate Fellow of the British Psychological Society, is registered as a Clinical Psychologist with the Health and Care Professions Council, and is an accredited Cognitive Behavioural Psychotherapist with the British Association of Behavioural and Cognitive Psychotherapies. He has extensive knowledge and skill in the theory and practice of REBT after more than 20 years’ experience working clinically within the NHS and private practice. In addition to his clinical experience, Richard has widespread experience of teaching and training in REBT. He is a Senior Academic Tutor in Cognitive Behavior Therapy (CBT) within the psychology department at the University of Birmingham, UK, where he is the lead for the Postgraduate Diploma in High Intensity Psychological Therapies, and Deputy Course Director of the Centre for REBT. This series offers a forum for original and cutting edge research exploring the latest ideas and issues in the psychology of sport, exercise and physical activity. Books within the series showcase the work of well-established and emerging scholars from around the world, offering an international perspective on topical and emerging areas of interest in the field. This series aims to drive forward academic debate and bridge the gap between theory and practice, encouraging critical thinking and reflection among students, academics and practitioners.